Today began with us taking our first class on how to birth some babies. I was disappointed. Don't get me wrong, the class was great. It was really informative and the woman who taught it was amazing. However, I've spent my entire life being shown what these classes are like in the movies and this class just didn't deliver on that level. We never got onto the floor on mats nor did she teach us how to breath really fast like hee, hee, hee, hee, hoo, hoo, hoo, hoo. There was a part where we practiced how to moan though. That was awesome. 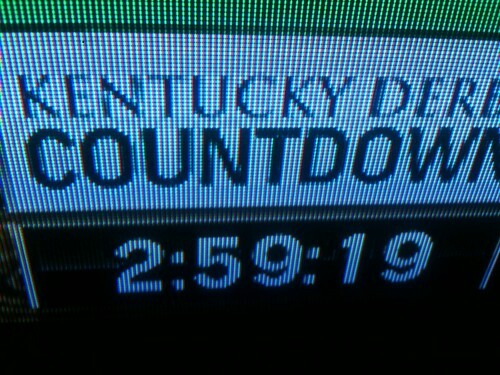 After returning home and watching the hockey game the Kentucky Derby took over our television sets. We were too tired to do anything about it. I figured I'd be able to watch a three minute horse race even though I cared about it so little. After watching some guys yap on and on about horses and furlongs Jen noticed the something we'd overlooked in the corner of the screen. That's right. There were over three hours to go until the derby started. That's when we turned off the TV and took a nap. 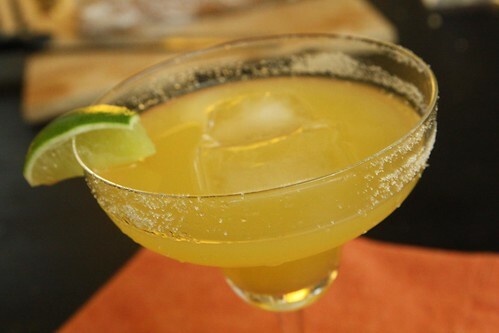 I started off tonight by making a virgin margarita for Jen. After all today was Cinco de Mayo. Since we have never met a foolish made up holiday we didn't like I decided to make something vaguely Mexican for dinner. One day there will be a made up holiday for every ethnicity in America so that Americans can get drunk and fetishize a different group of people. That's part of what makes America great. We had to go to the mall today to pick out some fabric swatches for the baby's room so I took advantage of this trip to try to find a tortilla press. Unfortunately I came up empty. This left me pressing my tortillas between two cutting boards with a small pan. This did not yield the thinness I desired but it was a passable technique in the absence of a press. 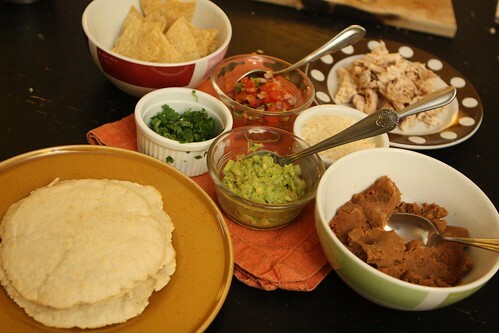 After cooking the tortillas on my pizza stone I put out a spread with chips, refried beans, pulled chicken tossed with spices, guacamole, salsa, and cilantro. I also made queso blanco which was a little more queso clumpo than I had hoped. I didn't really have the appropriate cheese so I tried melting some queso fresco down with milk, onion, smoked paprika, chili powder, a splash of hot sauce, and cumin. The flavor was excellent thought he texture was sort of like cottage cheese. 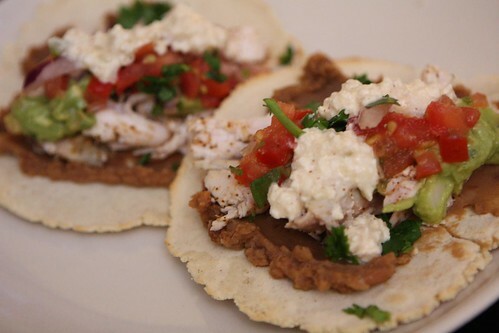 The finished tacos were quite good. 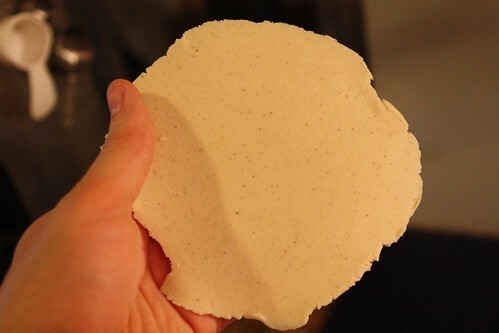 The tortillas did not have the texture of little old Mexican lady that could have improved them but they were as passable as you could hope from a French Canadian/Italian kid from Rhode Island. Mexico is not a country I associate with fine beer production. I could simply be misinformed since the only exposure I have is to the beers that are imported to America. What I've tried so far has not impressed me greatly. 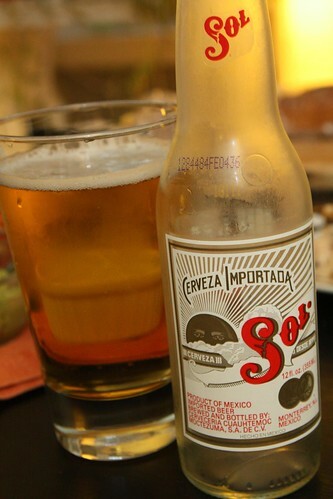 I wanted to go with a Mexican beer that I'd never tried before for tonight's meal, however, since I couldn't find one even at the huge liquor emporium I opted to go with this Sol from Cervecería Cuauhtémoc Moctezuma. I haven't had this beer since the 1990s and I certainly have not blogged about it since blogs did not exist at that time. This beer tasted pretty much like any other Mexican lager I've ever had. I thought I detected a slight soapy scent from the yeast but I think it was because I had just chopped a whole bunch of cilantro. Then I thought I smelled lime but I think it was because I'd just sliced some lime for Jen's margarita. At the end of the day I don't think it tasted like much. However, that tends to work well with spicy food. It was extremely easy to drink which was fine with me. I needed a night off from all those complicated beers.